Over the past few weeks I have found myself mulling over the lives of two people .There have also been several things that keep drawing my attention back to the lessons I have picked out from my reflections on these two lives. Both were famous in their own right, both were leaders and anointed by God. But one made it till the end and the other did not. Both had the same heritage of being part of a great nation; not just any nation, but the best, the chosen one, the beloved of God! Both had the same mighty man of God anoint them and be around if they needed him. What then set them both apart? The other day, my son posted a picture that he liked, on my Facebook wall; knowing it’s the kind of stuff his mum would appreciate. That is the picture you see. Things like this convinced me through the week that these private reflections need to be penned. My daily Bible readings have been in the books of Samuel and Kings. You may have guessed by now that I am talking about King Saul and King David. Where did he develop this desire, where did he learn this? He came from an ordinary family, whose livelihood was probably rearing sheep. I think this is where he learned this. He learned this while he was tending the sheep where he was all alone, where no one was watching, where no one could come to his rescue when the wild animals came. It is here he developed a quite walk with God. He cultivated a trust and a relationship with God. He realized that in the day of trouble, God alone is his refuge and ever present help. He learned to inquire of the Lord and seek His face. Tending sheep must have been pretty boring and lonely business. But it’s here that he got to know the heart and character of God. It was in the “dailyness” of life, in the mundane and not in some fancy school for the Prophets, or in some dramatic public ministry. He did not just know about God but he got to KNOW God. This comes through so strongly in the Psalms. This set him apart from his predecessor. Nowhere does scripture record that Saul had a private deep devotion to God. David even as a fugitive, while running away from an insecure leader that was baying for his life, realized that only God could save him. He inquired after God and was dependent on the counsel and strength that God gave him. When he became King, he did the same. He always inquired after God’s heart. He did respect and seek the counsel of the prophets but he had his own walk with God as well. When I look at Saul what strikes me, is that he did not know God. He knew about the God of Israel but he had no personal relationship with him. He had the heritage of being an Israelite, he had the anointing, he had the counsel of Samuel when he wanted it, and he had the Law of Moses to guide him. Yet, he did not know what pleased God and what did not. He was casual about his dealings with God. He used God as a lucky charm. He wanted God for blessings and success. And when he did not get it, he abandoned God rather than come to him in deep repentance which in contrast is exactly what David did when he sinned against God. Not only did Saul abandon his faith in God, but he began to consult with witches and mediums. The result we all know is that his reign was cut short and he lived a tormented soul. There is no substitute for a deep walk with God- deep roots, deep foundations built on obedience to the Word of God over a sustained long period of time, especially when no one is watching. I need to ensure this in my life at all times. Then as leaders we are to ensure the same in our people: make every effort to help them put their roots deep down- character takes time to build and there are no short cuts. Beware the ones that seem to be growing very fast – got a lot of flare, lots to show. The test is when the storms come; will they stand or be uprooted in a jiffy? 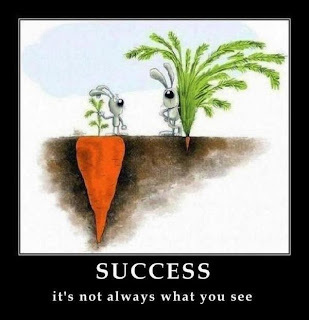 People tend to judge by outward appearances and scorn the little leaves that they see above the soil while praising the “little carrot with big bushy green leaves”. Don’t get flustered. Remember God looks at the heart while man looks on the outside. Our 18 years in Christian ministry has taught us this over and over again. Beware So(a)ulish advice – When David had to face Goliath, Saul was totally flustered as to how this young boy would tackle a giant. The kind of faith and confidence that David displayed in God was totally foreign to Saul. He just could not figure it out. So in his feeble attempts to advice David he tried to dress him in his armor. This was foreign to David! He knew what God had taught him in the secret place where he fought the lion and the bear. He knew that at the end of the day it was God who would give him victory – not his slingshot, not his sword. What have I learned from this? – many well meaning people will give you all sorts or counsel and advice. At the end of the day, if you have a walk with God and have learned to trust His still small voice, do not abandon that for anything. Even men of God will come and say things to you with all good intent but they could be wrong. ( Read 1Kings 13:1-26). Am I against the counsel of godly men? Far be it that I should go down that path! Over the years we have received some of the most invaluable advice from our mentors and other mighty men and women of God. Many big and small decisions in our lives have been guided by prophetic words we have received. So I am all for good counsel and prophecy. However there is no substitute for knowing God, knowing His Word and hearing his voice for yourself and have a peace in your heart and spirit that you have obeyed him. And I know time does tell in the end. There have been times we were given well meaning advice that did not bear witness with our spirits nor were they in line with the prophetic words over our lives and we have had to stand in our convictions and gently but firmly resist. If we had followed through with that counsel our lives would have possibly have been rocked beyond imagination. This makes me shudder and bow down before a holy awesome God- the God of Israel who neither slumbers nor sleeps, who has and will continue to watch over our lives. I would be wise to be a door keep in the house of my God for the rest of my days than anywhere else – no matter how attractive it may seem. If you have been drawn into this reflection with me then let us encourage ourselves that Jesus has not left us alone. He has given us the comforter, the Holy Spirit who will guide us into all truth. He dwells inside us and guides us in the path of righteousness for His name sake. Lets us be ones who KNOW our God and like His sheep we recognize HIS voice over all the noisy banter we may hear even on the Christian sound waves. Let us resolve to dig deep into His word, dig our roots deeper still and when needed seek out Godly counsel from safe, tried and tested men of God. At the end of the day – we stand alone before God to give an account of what we have done and not done. There will be no finger pointing, blame shifting on that day. I want to be able to say, I heard your voice and obeyed it Lord. And I want to hear Him say “Well done, good and faithful servant!” Lets get to KNOW HIM better. One Christ the solid Rock I stand, all other ground is sinking sand! God is also speaking to me much through the lives of Saul and David at the moment, and Terry Virgo also seems to be currently in the book of 1 & 2 Samuel, as is my David, which seems a remarkable coincidence. Clearly the Holy Spirit is speaking to us...I have felt God revealing a root of fear which leads to anger like Saul in my own life...and have recognised that although David was also full of faults (he had a wondering eye and could be vindictive - eg reclaiming Michal as his wife when she seemed happily settled) he was almost always obedient to God in terms of military strategies - he almost always enquired of the Lord, and then did exactly what the Lord said, except on the occasion when he first tried to reclaim the Ark of the Covenant. I have been challenged to fear the Lord, not man, and to obey His small promptings - this way we will escape the trap of fear which leads to anger and perhaps begin to host the manifest presence and awesome power of God in a new way. I have been fascinated with the Urim and the Thumin - and all the preistly functions of hearing God. It certainly was a barbaric age in which to live, with heads and forskins being cut off - on one occasion Samuel was required to hack someone to death!? !...and surely worthy of Speilberg! How good it is to be living under a new and better covenant, where God Himself is living in us through His Spirit. I am also challenged by what happened to Uzziah, presumptuously putting out his hand to stay the Ark. We should fear God as he begins to restore his awesome manifest power to the church, along with New Testament style signs and wonders, and not act presumtuously. God is great and He is holy and to be feared! Thank you for your openness and honesty . There is just sooo much to learn from the lives of these two men. But I think you have captured it well - the bottom line is the "fear of the Lord" or the "fear of man".